Winter can be harsh on your vehicle. It’s important to protect it from the elements, including heavy snow and ice buildup. If you don’t have the space or budget for a garage, a metal carport can provide excellent protection from harsh winter weather. At Yoder’s Dutch Barns, we sell metal carports of several different shapes and sizes. We build them to fit your exact needs and specifications. Whether you’re storing a single small vehicle, an RV, multiple vehicles, or any other need you can think of, we’ve got you covered. Why Buy from Yoder’s Butch Barns? When you buy a metal carport, you expect it to last for years to come. We’re an authorized dealer for R&B Metal Structures, and the quality of their materials is outstanding. They manufacture ultra-high-quality metal that’s designed to fit many different shapes and sizes of carports, and in several different colors if you’re looking to match an existing color scheme. Temperatures in Middle Tennessee are already dropping, and it won’t be long before the first major snow storms and ice storms hit the area. That’s why it’s important to be proactive and protect your vehicles, trailers, campers, and other assets before damaging weather arrives. We’re ready to take your order and help you get the perfect metal carport for your home or property today. Ready to Buy? Call, Visit, or Submit an Online Form Today. It’s our goal to make the process of getting a metal carport installed on your property as easy as possible. 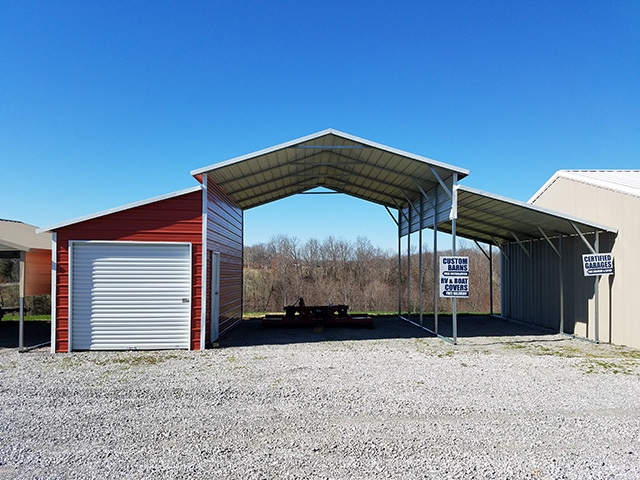 You can check out a selection of carports on our lot off Highway 48 North in Cumberland Furnace, Tennessee, and if we don’t have one you want in stock, we can order it for you. In addition, you can also order metal carports online here or by calling us at (615) 789-1030.